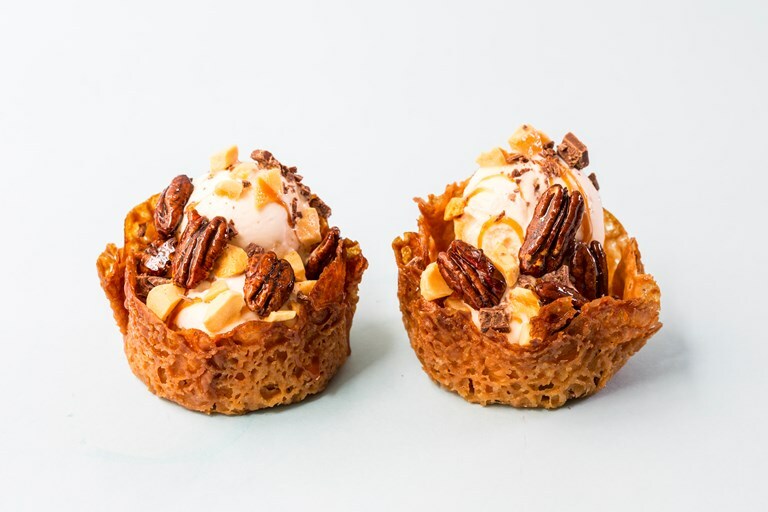 These decadent honeycomb ice cream sundaes combine caramelised pecans, lemon caramel sauce and honeycomb, all served up in homemade brandy snap baskets. To learn how to make honeycomb at home, visit our handy guide. Fry the pecans until the oil stops bubbling, as this is when you know all the moisture has evaporated. They should be covered in an even layer of golden brown sugar. Use the slotted spoon to remove them and scatter over the tray. Separate them from each other using two forks before the caramel starts to set or you will end up with one big lump of sugar and nuts!